In the Registry you can track your inventory with images, costs, market prices and populations in a secure, online environment. Build sets based upon your inventory and then compete with others who share your same passion. You can also build your own digital coin album which you can share with your friends. 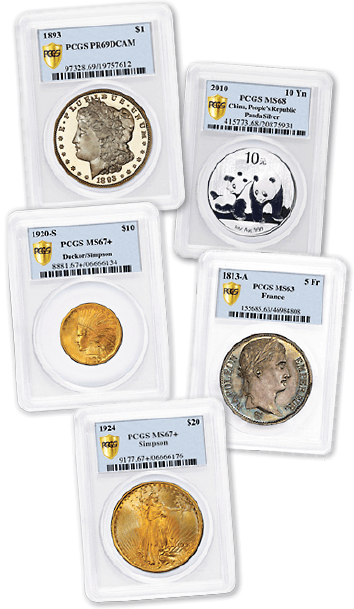 Plus, members of the Set Registry have exclusive access to the PCGS Shop Button, an incredible search tool that makes findings coins easier than ever. The Shop Button saves you time by bringing coin listings to you, all within an organized and filterable interface. This means you can search every conceivable venue for the coin you need - before someone else finds it - in just a few clicks. Sign up for the Set Registry now to try it out. Keeping accurate records is important to all collectors and the easy-to-use PCGS Set Registry offers a number of valuable tools to help you manage your collection. You can keep your collection completely private or you can build sets to compete with others who share your passion. Recognition for Your Collection. The Registry provides a safe and secure environment to showcase and share your collection with the numismatic community. Free Submissions for Sets. Depending on the size of your set, you can receive up to three free PCGS submissions for participating. A Valuable Pedigree. If your set ranks in the top five it may qualify for the free pedigree service. The PCGS Set Registry is a free program offered by the Professional Coin Grading Service. Established over 32 years ago, PCGS provides impartial grading and authentication by the world's top coin experts – the global coin industry standard in third-party certification. PCGS is a division of Collectors Universe, Inc. (NASDAQ: CLCT), the leader in authentication and grading services for high-value collectibles including rare coins, trading cards, tickets, autographs and memorabilia.